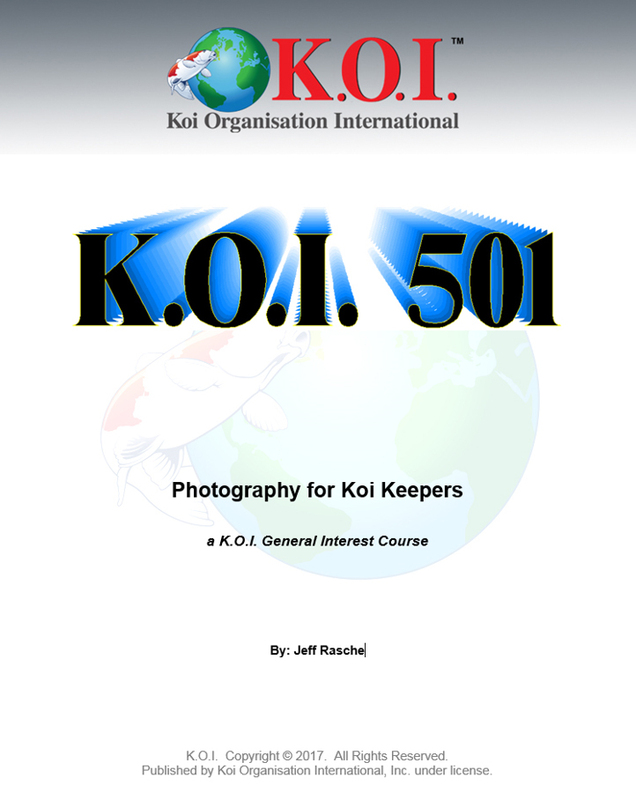 501 Photography for Koi Keepers | K.O.I. A. All of the photos should be taken AFTER you begin this course. B. None of the photos should be retouched by computer (that is a different class/subject). C. Each photo should be of a different from the other 9 you submit (not multiple angles from the same photographic session, for example). Some of them can be photos that resulted from trying the various suggested exercises, but none of them have to be. If you submit a related series of photos (“how to” illustrations), they count together as one of your ten photos. D. At least five of the ten should have something to do with ponds, fish, or the hobby. i. Please only submit photos and commentary that are o.k. with you to post for other students. As a class, all of us can benefit by reading the self-evaluation of others about their photos. (Any photos/commentary shared with the class will be done at the discretion of the instructor, but some photos from a few students may be selected to share, and therefore, by submitting your photos for this class, you are giving permission to share them with other students). ii. Your written evaluation of each photo should refer to at least two (more is preferable) of the most relevant principles described in this course. For example, you might comment on the focus, the contrast, the shutter speed, the placement of the subject in the frame, the time of day or use of light, etc. Many of the photos in this course are accompanied by the type (and approximate length) of commentary/analysis that the instructor is hoping you will provide with each of the ten photos you submit. iii. Any photo that includes a human being must be accompanied by a simple model release form if it is to be shared with your classmates or on the K.O.I. website. You can find a simple model release form on the web. iv. Please provide both constructive criticisms of your own photo (ways you think you could have made it better) and also statements about the strengths of the photo. F. For ease of communication, please group your photos when you submit them to the instructor into two different submissions, each containing five photos. You may submit more than ten photos to the instructor during the course as a basis for other questions or conversation, but clearly identify your official ten submitted photos. The instructor will focus time and energy on your ten photos, and may or may not have the opportunity to offer detailed responses to additional submissions. There are suggested exercises or photographic experiments sprinkled throughout the text (in red typeface). These exercises are NOT required in order to pass. They are simply intended to help you explore something new in a fun way. Try out the ones that appeal to you, or ignore them—that is up to you. Generally speaking, you will learn more if you spend time with a camera in your hand than you will merely reading about having a camera in your hand. The student will be graded not only on the photographs submitted, but on the assessment that accompanies each photo. There is no particular passing grade to complete this course but the instructor will work with the student until they both agree that the student is ready to graduate.